With all these new features and latest softwares from repositories, I think it makes no sense not to upgrade to Gutsy Gibbon unless if you don’t have a fast internet connection or way too crazy to upgrade. Upgrading to Ubuntu Gutsy Gibbon is painless. 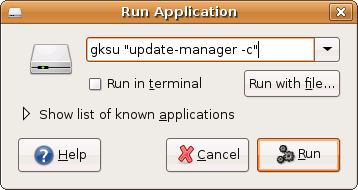 You only need to press “Alt-F2” from the desktop to launch the “Run Application” dialog, and type “gksu update-manager -c”. 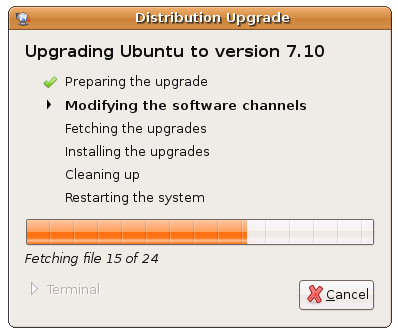 Press Upgrade and sit back, grab a cup of coffee while your Ubuntu operating system is being upgraded to Gutsy Gibbon. Note that Gutsy Gibbon upgrades will only be available on or after 18 October 2007, so stay tuned! Bro, what was your connection speed when you do the upgrade? Just want to know so I can calculate how much time will I need to upgrade using my 384kbps Celcom broadband. depending on the installations, usually it take less than two hours (or just under 40 minutes! ), switch to the latest mirror before upgrading – Please refer here http://blog.mypapit.net/2007/08/how-to-get-fastest-ubuntu-apt-get-repository-server-with-synaptic.html. Note that the so called ‘malaysian’ mirror is not always the fastest because of the ‘unusual’ bottleneck problem from the ISP . Taiwan ones are usually the best. I never done distro updates before…usually just setup everything new manually (after some backup). From your experience, does the update took a long time to complete (based on our local ISP speed)?